Houdini 6 PRO is once again the confirmed leader among chess playing programs, having won the TCEC 2018 Championship for chess engines. Houdini 6 PRO continues the impressive surge made by its predecessor by adding another 50 to 60 Elo in strength, to become once again the strongest engine that money can buy. The PRO version cpming with the package supports 128 cores and 128 GB of hash. What's the difference? - Check the comparison table we made to help you choose the best product for your needs. This November Convekta Ltd released Houdini Aquarium 2019 - an excellent analysis tool combining the world's strongest engine Houdini 6 PRO and the updated ChessOK Aquarium interface. 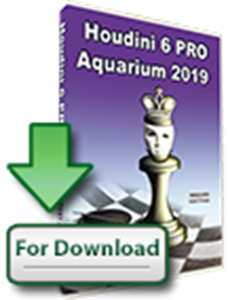 Houdini Aquarium 2019 includes the world's strongest chess engine – Houdini 6 PRO UCI capable of supporting 6 cores and 4 GB of hash, a powerful search system, a unique Tree mode, database of 7.077 million games in total (as of November 2, 2018), a Bonus disk Chess 1 Year membership at ChessOK Playing Zone. You can connect Houdini 6 PRO UCI engine to Chess Assistant, Fritz and ChessBase. Interactive Deep Analysis (IDeA) is the most advanced chess analysis method available today. The purpose of IDeA is to analyze a position deeply and return as much information about it as possible to enable the user to get a better understanding of the nuances of any position. Its approach makes it an essential weapon in the arsenal of every serious player and analyst! Simultaneous analysis by multiple Houdini instances. Use 2, 4, 10, 20 or even 50 chess engines at the same time for faster results! Use the power of multiple computers for analysis at the same time and collect all the results automatically on your own computer! Use the computers on your home network or connect to computers over the internet to increase the analysis power! Read more about IDeA below. 1 Year membership at ChessOK Playing Zone. Aquarium Articles Reference Page - learn more about Aquarium's functions and how to use them. The Interactive Deep Analysis, or simply IDeA, is Aquarium's trademark feature and what really sets it apart from similar programs. It has come a long way since its introduction in the fisrt release of Aquarium, and is still improving. Serious players will probably find it is an essential tool to stay competitive. But explaining what IDeA is and how it works will require more than a few bullet points in the product description. If you want to know, go ahead and read on. IDeA is one of the most advanced chess analysis methods available. It will allow you to use your chess engine to its maximum. The purpose of IDeA is to analyze a position deeply and return as much information about it as possible to enable the user to get a better understanding of the nuances of any position. IDeA keeps a permanent record of its analysis in a tree structure, which is unlimited in size. The user can browse the analysis tree at will, both while the analysis is in progress and after it has finished. The user can direct the analysis into the positions that are of most interest to him by excluding or adding positions and variations to the analysis. IDeA is an incremental analysis method, which means that it can be stopped at any time and the next time it is started, it resumes where it left off. Users can exchange analysis trees, work together on analysis projects, combine their results etc. In short IDeA is is highly selective search, controlled by Aquarium (and the user). Interesting lines are analyzed deeply, but weak moves are only considered briefly or not at all. Don't forget that the "I" in IDeA stands for "Interactive" and your involvement in the analysis process is the key to understanding and improving the analysis. Analyzing with many engines. The current version of IDeA can split the analysis between many engines. You can, for instance, use four instances of single core Houdini for the analysis on a quad computer, essentially reducing the multiprocessor overhead to zero. It's like getting one extra core for free compared to running Houdini in 4-CPU mode. Analyzing on a network of computers. This feature is a dream come true for power users, analysts, and serious players who want to take their analysis to a new level. If you own two computers, you can of course run Aquarium on one of them and use it for the analysis. In the current you can also add engines running on your other computer to the pool of IDeA analysis engines. You can use as many engines analyzing simultaneously as you need. The engines can be run on various computers, some on local networks and others in different countries - as long as they are all connected to your Aquarium Internet. IDeA takes care of splitting the analysis between the available engines. Multiple IDeA projects analyzed in parallel. You can define many analysis projects, each with its own analysis and tree settings. IDeA can analyze any number of those projects in parallel. The status of each project is saved between sessions, so you can manage many different IDeA projects much easier than before. Multiple analysis "roots" for a single project. The starting position for IDeA analysis is called a "root." If you are analyzing a position in IDeA when another interesting position shows up in the tree, you can make it a new root, without even stopping the analysis. You can remove the original root or let IDeA analyze from both roots. You can use this feature to focus IDeA on selected positions without restarting it. IDeA can keep a list of all roots that have been used in a project. Shaping the analysis tree. Aquarium has a number of settings that have a significant influence on the shape of the IDeA analysis tree. The "Tree width" parameter determines how wide the resulting IDeA tree will be. The maximum length of variations can be defined. This allows you to make the tree denser near the root and avoid very long variations. Analysis can be limited to positions within a certain evaluation range. Positions outside the specified range will not be explored further. The number of alternatives generated for White/Black can be limited. A "preferred side" can be set; e.g., for developing your opening repertoire. A list of "thematic moves" can be given. You can use them to ensure that certain moves are always analyzed. For instance, in an attacking game you might want to make sure that the moves Bxh7+ and Ng5 are considered. "False alarm check" immediately performs additional analysis of new moves that look "too good to be true," preventing IDeA from spending more time on them if they turn out to be worse than they first looked. All of these settings can be changed on the fly during the IDeA session, further emphasizing that IDeA is designed to be used as an interactive tool. Move repetition detection. IDeA tasks do not consist of a single position, but a full line that leads from the root node to the position to be analyzed. This enables the engine to report 0.00 scores for twofold repetitions, and is generally more correct. This also leads to the fifty-move rule being observed. Automatic backup of analysis trees. Besides more robust tree handling in IDeA, the analysis trees are automatically backed up. Not only does it prevent data loss, but it may also prove useful in some other cases too. Browsing the analysis queue. You can see a list of all tasks for the current stage; which tasks were automatically scheduled by IDeA and which ones you added manually. The corresponding positions can be displayed on the board and you can see the engine's output for the selected task, prioritize the tasks, and delete unnecessary ones. If there are tasks waiting in the queue when you stop the analysis, they will be stored and processed the next time you start the analysis, even if you restart Aquarium. Houdini Aquarium 2019 comes with 3-month access to all courses available at learn.chessking.com. If you are feeling overwhelmed by all the features and think that you will need years to learn how to use them, don’t worry, just take the first steps and you will find that IDeA can work more or less automatically. After seeing how it works in automatic mode, you may want more control over the analysis. At that point, just read the relevant article from the reference list and step-by-step you will master all the tools. It has to be emphasized that every IDeA option is based on a practical need and many of them were pointed out by Aquarium users. The implementation of the analysis and the new features were carefully discussed and then tested by beta testers. Only the features that were shown to improve the analysis are included in Aquarium releases. Step-by-step you will find your favorite settings and greatly increase the efficiency of your analysis.